302 Berkeley is located on the west side of Berkeley, between Beacon and Marlborough, with 304 Berkeley to the north and 300 Berkeley to the south. 302 Berkeley was built for building contractor George Wheatland, Jr. ca. 1867, for speculative sale, one of two contiguous houses (300-302 Berkeley) in a symmetrical composition with matching two story oriel windows and arched, recessed entries. Click here for an index to the deeds for 302 Berkeley. On June 9, 1868, 302 Berkeley was purchased from George Wheatland, Jr., by Sarah Anne (Boott) Jackson, the wife of real estate dealer Francis Henry Jackson. Their son, James Jackson, lived with them; he was a partner in his father’s firm. They previously had lived at 14 Marlborough. Francis Jackson died in July of 1873, and Sarah Jackson continued to live at 302 Berkeley. By 1874, she had been joined by her son-in-law and daughter, Henry Winsor, Jr., and Elizabeth (Jackson) Winsor. They previously lived at 62 Bowdoin. Henry Winsor was a real estate broker. James Jackson also continued to live at 302 Beacon. After his father’s death, he had became a stockbroker with the investment banking firm Lee, Higginson & Co. He married in the mid-1870s to Rebecca Nelson Borland and, after their marriage, they lived at 302 Berkeley until about 1881, when they moved to 8 Fairfield. Sarah Jackson died in December of 1886, and on October 20, 1887, 302 Berkeley was transferred to James Jackson as trustee under her will. 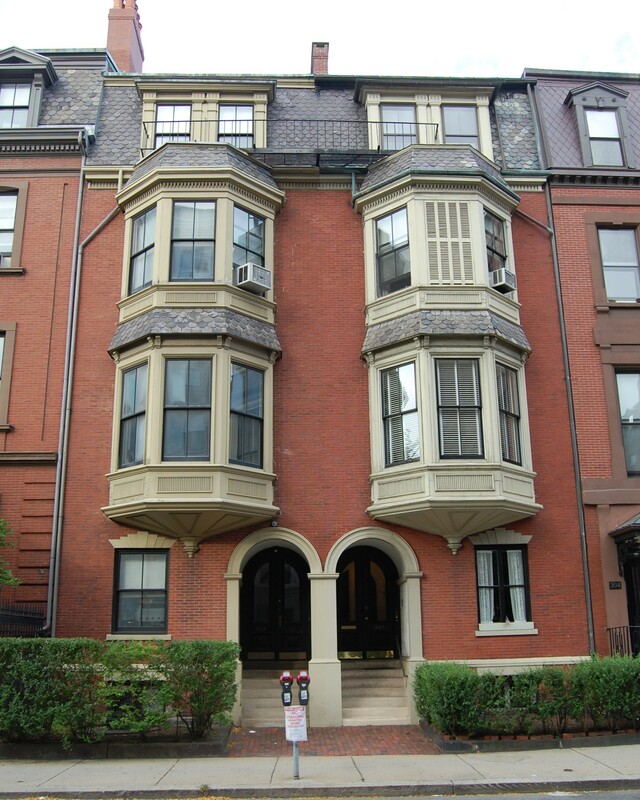 Henry and Elizabeth Winsor continued to live at 302 Berkeley after Sarah Anne Jackson’s death. 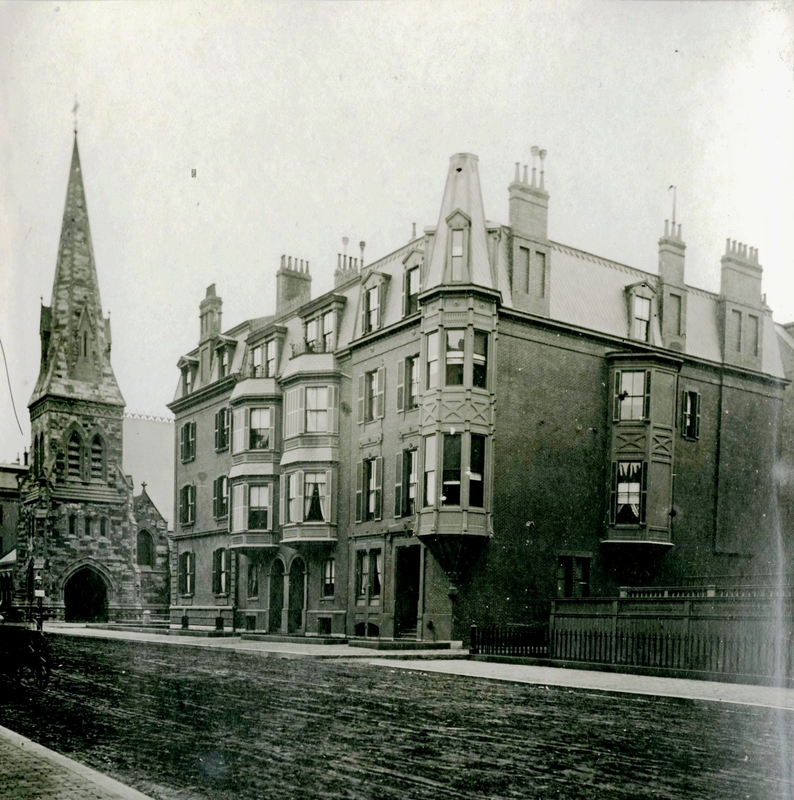 During the 1891-1892 winter season the Winsors were living elsewhere and 302 Berkeley was the home of Richard Dudley Sears and his wife, Eleanor Mary (Cochrane) Sears. They had married in November of 1891 and 302 Berkeley probably was their first home together. They also maintained a home in Nahant. Richard Dudley Sears was a real estate trustee. In 1881, he had been the first American men’s singles champion in lawn tennis, and was the winner of that title for each of the six following years. By the 1892-1893 winter season, they had moved to 116 Beacon. By the 1892-1893 winter season, the Winsors had resumed living at 302 Berkeley. Henry Winsor died in August of 1894. Elizabeth Winsor continued to live at 302 Berkeley. During the 1896-1897 winter season, Elizabeth Winsor was living elsewhere and 302 Berkeley was the home of dry goods merchant Wolcott Howe Johnson and his wife, Fanny J. (Betts) Johnson. They had married in October of 1895 and 302 Berkeley probably was their first home together. 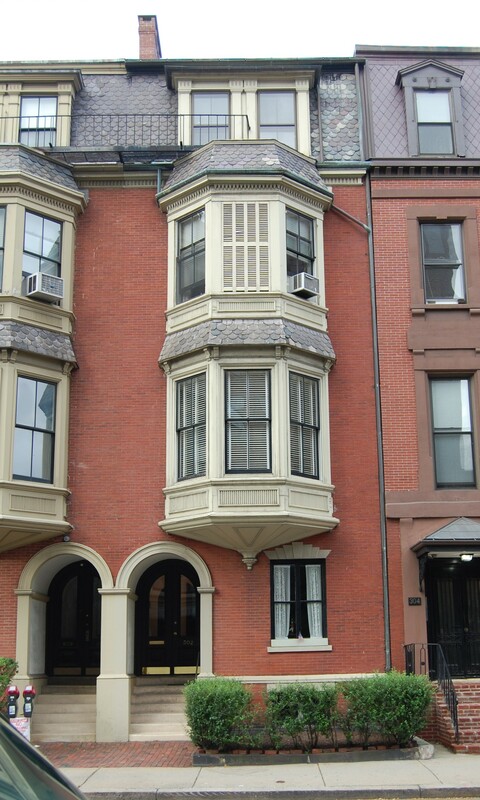 Prior to their marriage, he had lived at 7 Commonwealth with his widowed father, Samuel Johnson, Jr. By the 1897-1898 winter season, they had moved to 217 Beacon. By the 1897-1898 winter season, Elizabeth Winsor living at 302 Berkeley once again. She continued to live there during the 1898-1899 season, but then was living elsewhere for the next few years. By the 1899-1900 winter season, 302 Berkeley was the home of insurance agent Henry Edwards Russell and his wife, Frances (Cook) Pope Russell. They previously had lived at Haddon Hall at 282 Berkeley. They remained at 302 Berkeley during the 1901-1902 season, after which they made their home in Manchester. By the 1902-1903 winter season, 302 Berkeley was the home of attorney Charles Cobb Walker. He also maintained a home in Manchester. He continued to live at 302 Berkeley during the 1904-1905 season, but moved to 7 Arlington thereafter. By the 1905-1906 winter season, Elizabeth Winsor had resumed living at 302 Berkeley. She continued to live there until her death in March of 1912. The Winsors had no children and James Jackson had died in April of 1900. 302 Berkeley was inherited by his three children: Madeline (Jackson) Lee, wife of George Cabot Lee, James Jackson, Jr., and Rebecca Borland (Jackson) Hallowell, wife of Robert Haydock Hallowell. On July 23, 1912, 302 Berkeley was acquired from them by Marian (Lawrence) Peabody, the wife of investment banker Harold Peabody. They previously had lived in Milton. They also maintained a home in Bar Harbor, Maine. During the 1925-1926 winter season, the Peabodys were traveling abroad and 302 Berkeley was the home of Arthur Cecil Butler and his wife, Cicely (Hyland) Butler. He was an importer of textile machinery. They had previously had lived at 441 Beacon. They had moved from 302 Berkeley by the 1926-1927 season, and by the next season were living at 251 Beacon. Harold Peabody died in September of 1961. 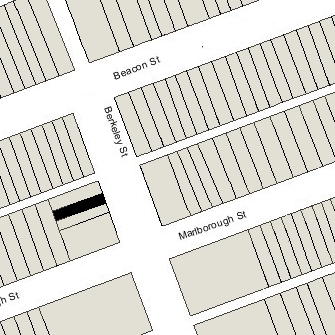 Marian Peabody continued to live at 302 Berkeley until about 1970, when she moved to Milton. 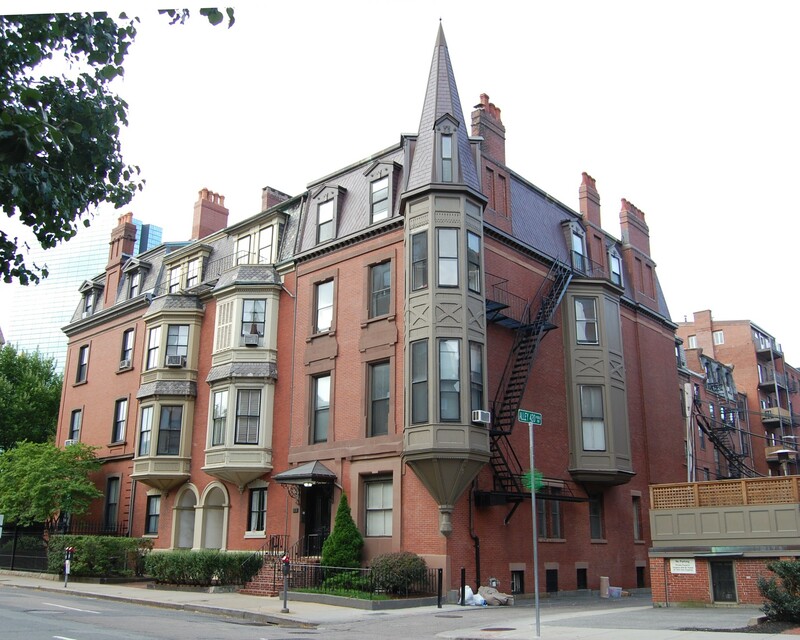 On June 23, 1970, Marian Lawrence donated 302 Berkeley to the Protestant Episcopal Diocese of Massachusetts (her father, William Lawrence, had been the Episcopal Bishop of Massachusetts from 1893 to 1926). On October 26, 1973, 302 Berkeley was purchased from the Episcopal Diocese by Gary Prescott Hayes and his wife, Susan (Phillips) Hayes. Gary P. Hayes was an assistant to police commissioner Robert J. DiGrazia and served as a liaison between the police department and city hall. He resigned in 1976 and moved to Bethesda, Maryland, to become the first executive director of the Police Executive Research Forum. 302 Berkeley subsequently changed hands. It was assessed as a two-family dwelling in 2015.